Despite Overwatch being out for a few months there is still a ton of people getting the game for the first time, so i felt it would be right to make a list of 5 characters players should use when new to the game. 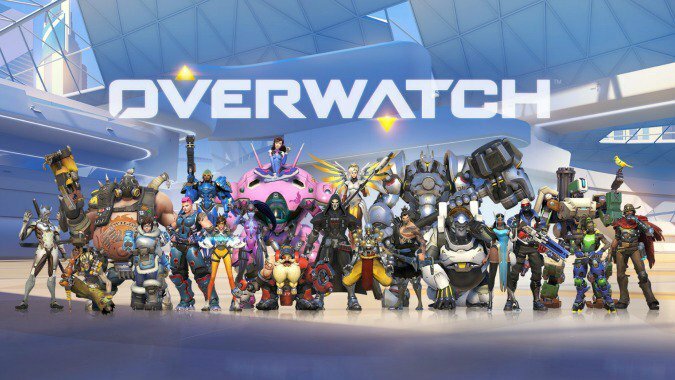 With over 21 characters in Overwatch it can be a bit overwhelming to see what character you could play at and still be a good player for your team, every character is in no doubt fun to play in their own right but some require a lot more time to master than others. so with that being said lets get right into the list. He has a Pulse Rifle which is able to shoot 25 rounds in a thermal clip, as well as a mounted pulse rocket launcher able to deal some splash damage, but its mainly impact damage you look for with this thing as their is no drop over time with it. He has a Biotic Field which allows him to heal himself and allies allowing him to stay in the front of the fight as much as possible, you can essentially hold back an enemy push if your good enough, and being the only character in the game with the ability to sprint indefinitely 76 is the most all around character, being good at damage, durability and speed. 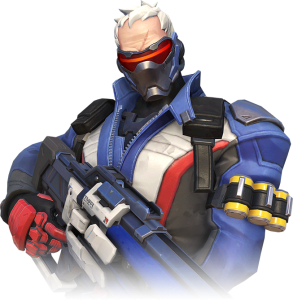 His ultimate Tactical Visor can lock on to enemies within sight, there is no chance for you to miss while using the ultimate, and you reload quicker, however all you do is shoot the body, no way to get head shots. 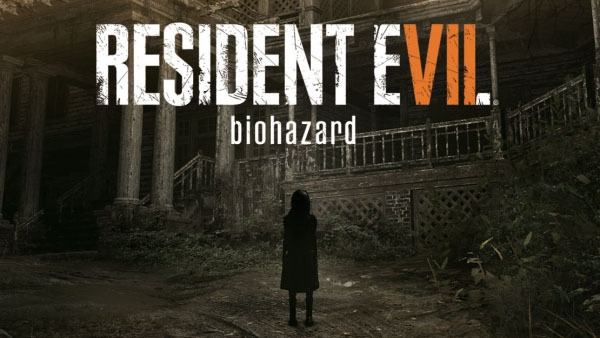 With him essentially owning Medium Range, and getting stronger as of the most recent patches , hes the overall the most effective and familiar character on the roster. The Omnic Shambali Monk that spreads peace and tranquility through the destruction of his enemies, Zenyatta is probably one of the characters most dependent on aim and positioning, than any of the other characters, simply because hes one of the few characters that doesn’t have an ability to get him out of sticky situations, he just kinda has to float there and deal with everything that’s thrown at him, but i think that’s what makes him so good for a new player, being a pretty decent healer and excellent dealer of pain, he provides the same type of balance of game play that 76 provides, only you will be mostly viewing most of the action from the back line instead of the front. 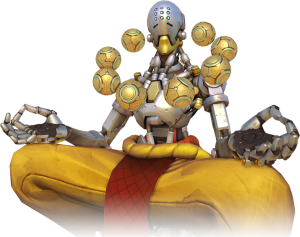 Zenyatta can shoot 20 energy shots before needing to concentrate his chakra again, he has an alternate way to shoot which rapidly shoots a few shots after charging it for a few seconds, his primary fire alone, can deal plenty of damage, and the projectile is one of the fastest in the game meaning you wont need to lead targets if at all at short to medium range. That’s not all in Zens arsenal though, he has the orbs of Harmony and Discord that completely balances his kit. The Orbs Heals Allies and Increase Damage on Enemies Respectively, both working via line of site, it makes Zenyatta a good choice for more offensive minded players that have really good aim and probably couldn’t choose offense because there was three Reapers already on their team, and since they wont wait for a healer anyway, might aswell try and pick up the slack with a more lethal support. His Ultimate ability Transcendence gives him the ability to heal allies much faster than any healer, while also being invincible and having an much faster movement speed once you figure out the right timing for that ultimate, your going to have your enemies hating the Iris and all of its blessings. Junk Rat is equipped with a grenade launcher that shoots five grenades, when shot, they idle for a few seconds before exploding unless an enemy is near, in which case they will explode on impact, this means you can bounce the grenades off walls without worrying since they explode instantly when near an enemy. timing wont really be an issue for you with junk rat. Aiming will though. not direct aiming, but being able to shoot at interesting angles and spots or simply learning the grenades effective range and knowing the angle the grenade drops at, which ends up coming naturally after playing for awhile. Junk Rat also has a remote Mine that he can detonate, which can be useful to place in unexpected corners since it has knock back, so you could knock enemies off the map, or throw it in a desperate attempt to get some burst damage, or one shot a character with 150 health or less. 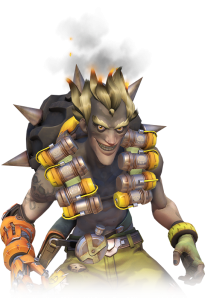 Junk Rat also has a trap that can sink into the ground being hard to see for unaware enemies, meaning that if you think creatively and learn the maps, you have the potential to be more annoying than Mei or Bastion for the other team, a true Trickster. 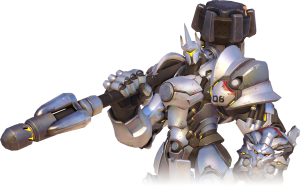 His Ultimate is his Rip Tire, his seemingly sentient tire, is similar to a remote controlled car explosive, you can even climb certain structures with it, but it loud motor sound can be heard from anywhere, so mis-direction is encouraged to get good use out of it, it has a pretty good explosive range, and can essentially kill anyone, as long as their not mitigating it in some way. The keeper of the all important Rectangl- i mean energy shield that keeps allies safe during the important push on the objective, playing Reinhardt, is welcoming and simple in practice, all you have to really do is stay with your team and hold your shield up, they cant hit them if their behind you, and if people start getting too close, you push them back with your other abilities and try not to lose focus, even if an enemy gets passed you, trust your team that they will get them and don’t drop that shield, unless its a Tracer. Reinhardt Wields his mighty rocket hammer, which will be good for eliminating most of the offensive heroes that will be your main annoyance if they get too close. He is able to launch a projectile that can go through most shields and can make for a pretty good surprise attack, and can get most players that try to run away. He is also able to Charge and potentially pin characters, killing most character at 200% health or less, its usually unavoidable at close range, while the opposite is true for long range, it has other creative uses, though using it to charge the objective isn’t exactly recommended. To finalize Reins kit he has his most important ability and what keep his Knight appearance together, his huge energy shield, to put it simply its a rectangle, that protects allies from most incoming damage, of course energy based attacks can still go through the shield, but most incoming damage is effectively dettered by the energy shield, more importantly, allies can shoot through it, so being Reinhardt allows you to play one of the most important roles your team has next to Healers. His ultimate causes him to bring the hammer down, Earth Shatter, does exactly that, stunning enemies in place for a good few seconds leaving them wide open for a piece of sweet German engineering. Lucio is essentially that type of character that is easy to play and still effective, and extremely effective at high level play, though that has changed in competitive due to balance changes, Lucio at regular play is still a character that has significant impact on the game. His primary weapon is a speaker that is able to shoot sound waves in bursts that do a decent amount of damage while also being able to shoot a more wider blast that does significant knock back, and does enough damage to kill at low health. The most important thing about Lucio’s Kit is his music, he has two audio tracks That have different effects when played, and if mixed together it creates a Synergistic Audio, which is the name of his album, He can switch between tracks on the fly, and if allies are in sight of him, his music can make them move faster or heal them over time, and he can boost the volume of his music for short bursts of increased effectiveness. 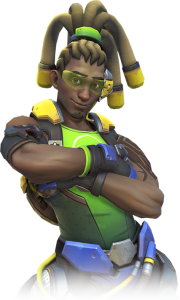 The final thing Lucio has available is his ability to wall ride, which with his added speed with his music tracks, it makes him a character able to slip in and out of combat, while also still keeping his teammates alive while not even needing to be really close to them. His Ultimate, Sound Barrier, lets him cover his allies in a protective barrier effectively giving everyone tank levels of health in the form of shields which makes him one of the most welcoming characters to play as, and you would usually never feel as if your not contributing while playing as him. These are just a small piece of all the characters that overwatch offers, and they will allow you to get used to the game, and eventually, find your character that you just love to play as, and are really good playing as, every character has their pros and cons, and its learning them and knowing when and where to use them to your benefit, is what makes this game fun to play and just as satisfying to master.